Green smoothies are in great abundance these days. They are as synonymous with healthy eating as bliss balls, almond butter, and kale chips. 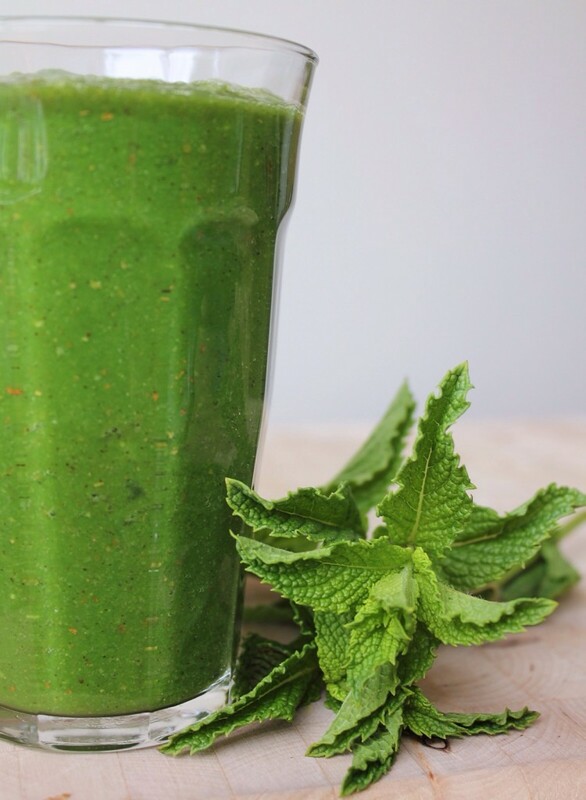 Green smoothies make healthy eating easier, and we would sure be sad without them. But let’s talk about making a modern version, that is lower glycemic and full of real, whole-food nutrition. Choosing fruit that is lower glycemic and leaving the skin and seeds intact is a good way to start. 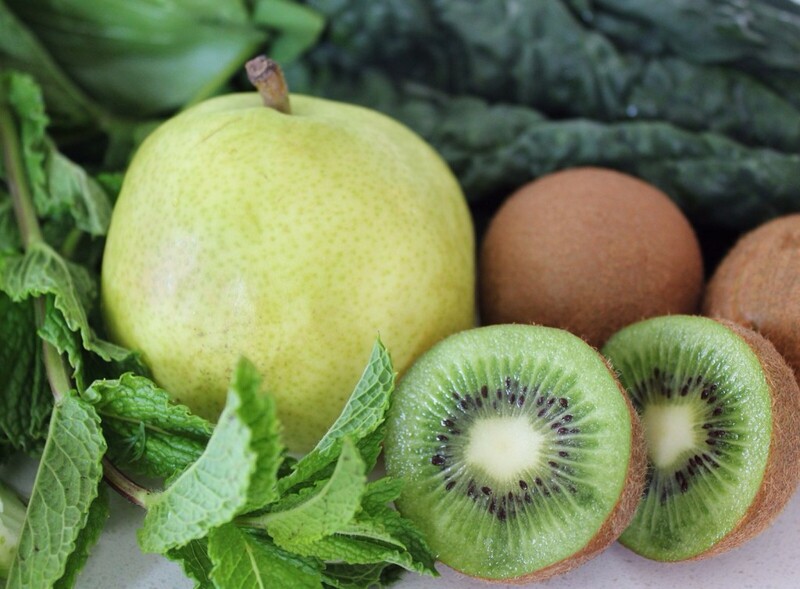 This way we get the antioxidants from the fruit as well as the fiber, seeds and pectin from the whole fruit. This slows down the absorption of the sugar into your blood stream, and therefore keeps your blood sugar in check so that your cancer cells won’t be enjoying an all you can eat buffet. Berries and cherries are a great example of this (and those hand-staining pigments mean they are PACKED with antioxidants), so are kiwis, pears (blend smoother than apples too), and plums. Now for the vegetables. I like to use a combination that will add juiciness (cucumber, celery, Napa cabbage, broccoli stems, bok choy bottoms) and also the green plant-blood business (kale, spinach, collards, swiss chard, parsley, mustard greens, dandelion greens, bok choy tops). The watery vegetables tend to be milder in flavour so you can add more, while the green ones tend to be a little more intense and bossy, so you might want to add less. 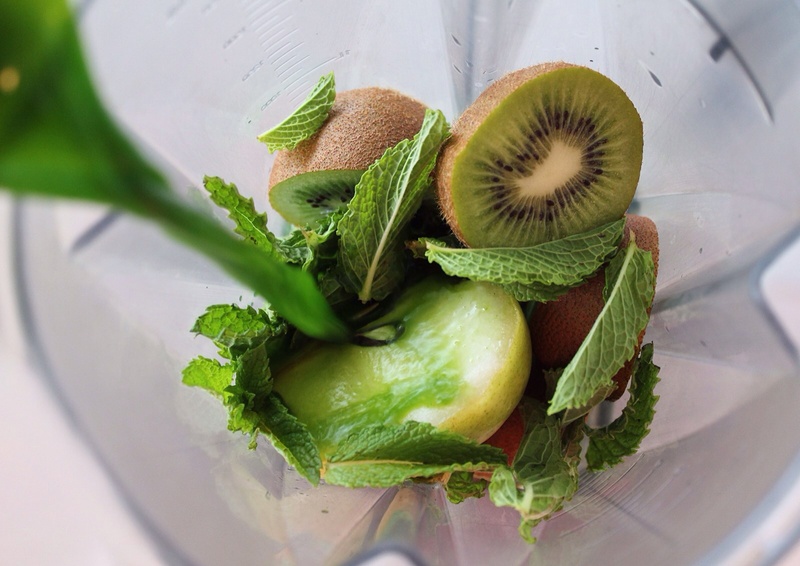 Blending a combo of any of the above-mentioned foods, in a good blender, perhaps with a squeeze of lemon and a cup or so of water (or coconut water/homemade almond milk), will make a delicious and healthy modern day smoothie. If green smoothies are a new concept to your taste buds, you may want to add a little more fruit until it tastes good to you. That part is important! You are not supposed to be suffering through it. But if you get into the habit of drinking them, you may find that you can eventually scale back the fruit and maybe up the bossy veggies. 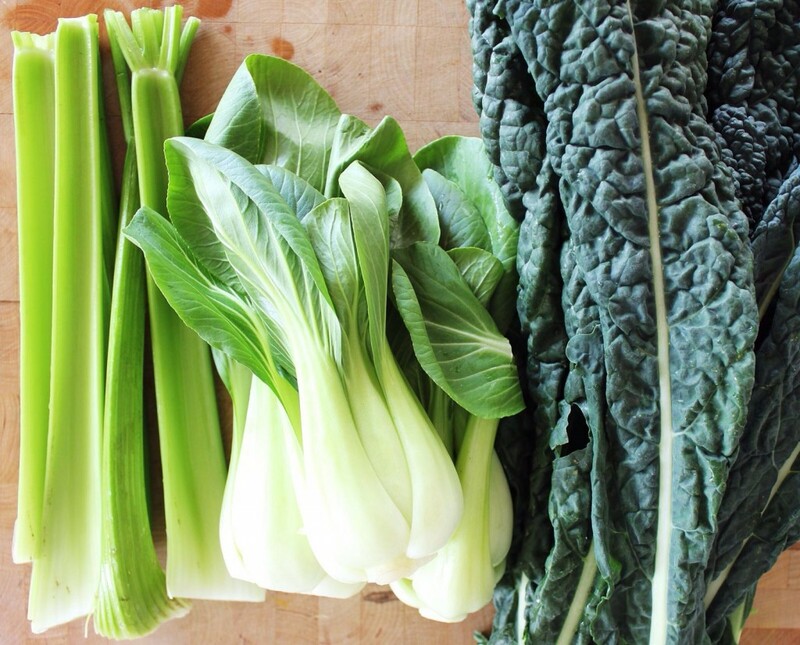 The benefit of making your smoothie this way is that you can drink all of the nutrients from an ENTIRE bunch of kale, 4 Shanghai bok choy and 5 celery stocks in about 2 cups of juice. Do you see where I’m going here? The juicer literally wrings out the veggies, squeezing out all of the nutrients and hopefully (depends on the quality of your juicer) leaves the leftover fiber devoid of anything good for you (besides fiber). By juicing your vegetables, you can get the nutrients from sooo many more vegetables than you could comfortably eat in a day. But wait! 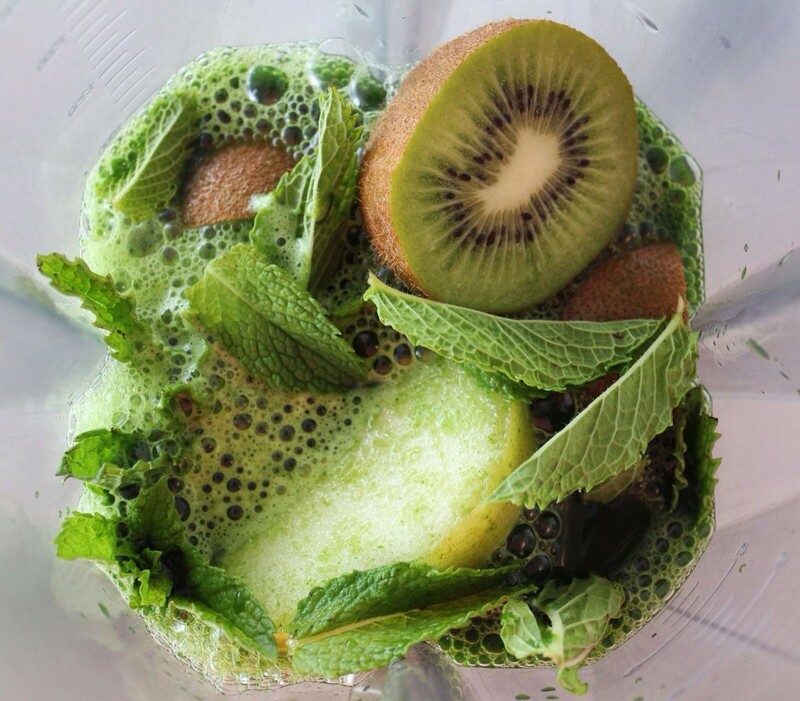 We are still getting the fiber which slows down the absorption of the sugars into our blood stream, thanks to the fruit that is not put through the juicer, but goes straight into the blender. Just an idea, you know, if you’re feeling ambitious. There is always a show off move, but really, the point is to get at least one slam dunk meal a day, even if it comes in a glass with a (glass?) straw. More vegetables, leafy and otherwise, and more antioxidant-rich fruit means more stressed out cancer cells and more happy dances. Chop up the fruit, squeeze the lemon and pick the mint leaves. throw it all into the blender. Pour the veggie juice over top and blend until smooth. It’s so smooth and delicious, you’re going to want to gulp it down, BUT HOLD ON! By swishing it around in your mouth, chewing it a little (phantom chewing?) before swallowing, you will set up your stomach for better digestion. Blend everything together with 2 cups or so of water, homemade nut or seed milk, or coconut water. Sip, chew, swallow, sip, chew, swallow…. I love it, forces you to chew and it would turn it into a serious meal (without protein powder). Maybe soak the nuts/seeds first? Great idea, thanks! a thought – I throw 1/4 cup of raw cashews, raw sunflower seeds, and raw pumpkin seeds, plus 1 Tbsp each ground flax seeds and chia seeds, in my smoothies and turn them into protein drinks. The nuts and seeds don’t seem to change the flavor. If you aren’t patient during the blending, there will be a little bit of chewing, but like you said, chewing helps digestion.